Church service. 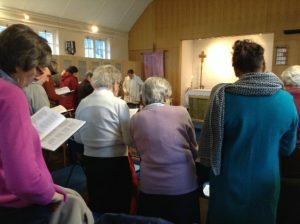 Holy Communion on 1st and 3rd Sundays. Sometimes we have a breakfast service where we sing, pray and discuss world events from that day’s newspaper whilst enjoying breakfast. Also from time to time we have songs of praise which can be in the morning or sometimes in the afternoon when we also have a cream tea. There are also special services for Good Friday, Easter and Christmas. There is always fairly traded filter coffee after every service. Community Coffee. 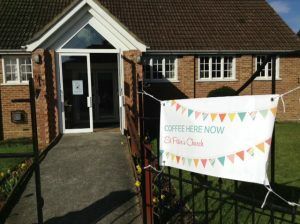 This is a lively coffee morning for people from the community to come into the church to drink coffee, meet each other to chat and is run by people from the community. Morning Prayer in the church. 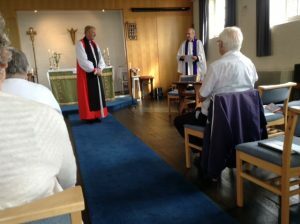 We use this as an opportunity to pray for the needs of our church and people in the community and usually say the Anglican Daily Office or Celtic morning prayer together. Tea and Toast in the Hall. Young people aged between 11 and 15 years of age meet together for games, tea and toast and hear something of God’s work here on earth. Together they discuss related topics and are helped to make decisions about their lives. Messy Church 10-30am – 1pm including brunch. A morning of fun for families, with crafts, games, activities, stories, songs and friendship; including a delicious lunch. Join us as we find out more about God by having fun and making a mess. Free: no cost, but please donate what you can. For more information on this call the church office on 01935 414097 or e-mail office@stjamesandstpeters.org.uk. 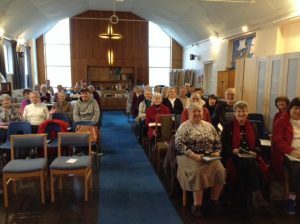 St Peter’s also supports the work of Christians Against Poverty, Christian Aid, Street Pastors, The Lord’s Larder and other charities.